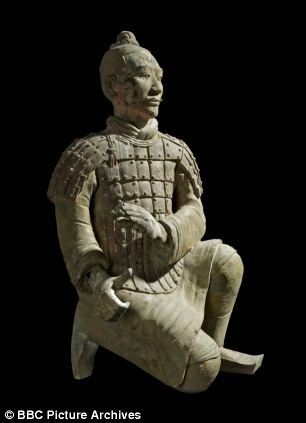 The Terracotta Warriors are described as one of the 8th wonders of the world, but the life-size figures created over 2,200 years ago, were inspired by artwork by the ancient Greeks, one expert claims. 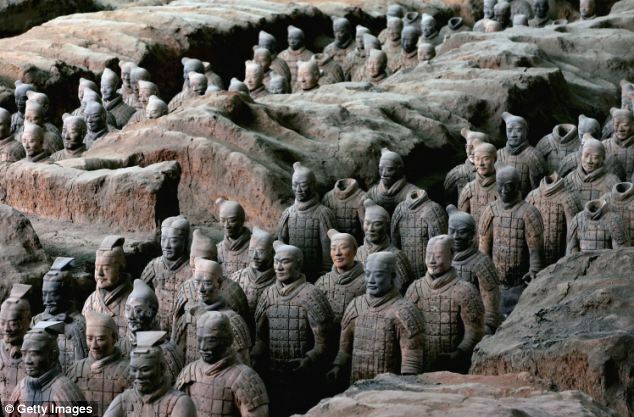 Lukas Nickel believes it is ‘likely’ the 8,000 giant sculptures, which were buried in pits close to the mausoleum of Qin Shi Huangdi, were the result of contact between Greece and China. He cites newly translated ancient records that tell of giant statues appearing in the West, which inspired Qin Shi Huangdi, as evidence that the warriors of the First Emperor were based on 12 earlier life-size statues. ‘It is perfectly possible and actually likely that the sculptures of the First Emperor are the result of early contact between Greece and China,’ Dr Nickel, a reader at the University of London, School of Oriental and African Studies, told LiveScience. Before the time of the First Emperor, there were no life-size figurines created in China and he thinks the idea came from Alexander the Great’s campaigns. The records, which Dr Nickel translated, reveal the statues were around 38ft tall (11.5m) and impressed the Emperor who built duplicates of them in bronze. The bronzes no longer exist as they were destroyed after the death of the First Emperor. However, a number of writers of the time documented the statues’ existence, Dr Nickel wrote in the journal Bulletin of the School of Oriental and African Studies. 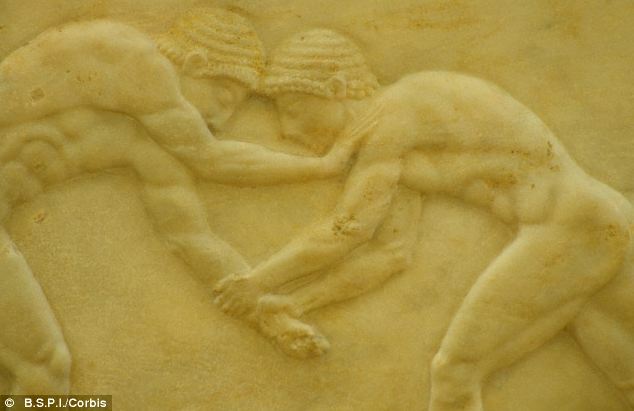 Records suggest there were links between China and Greece and that sculptors were influenced by Greek culture. Dr Nickel believes statues of semi naked acrobats and dancers, which were found in another pit close to the mausoleum, are so realistic as sculptors learned from Greek masters, who collectively took centuries to perfect such realism in their sculptures and etchings. He wrote: ‘The [Chinese] sculptors attempted to render a bone structure, muscles and sinews to depict a person in movement. However, while Dr Nickel believes he might have solved the inspiration behind the Terracotta Warriors, it remains a mystery why rulers of the Han Dynasty stopped making large sculptures and instead swapped to miniatures. He suggests that the craftsmen who mastered how to build the huge figurines might have died without passing their skills on to the next generation, or that it was thought to be unlucky to replicate foreign models.